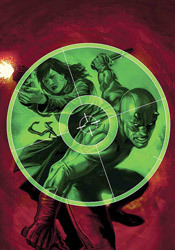 Ed Brubaker and Greg Rucka have taken Daredevil readers on quite a ride since wrangling the book’s storytelling duties, and this arc looks like a chance to slow things down before the next major super villain comes to Hell’s Kitchen. In most cases, that would mean a skippable throwaway change-of-pace tale… but that’s Brubaker and Rucka’s bread and butter. A lot of the allure of this character lies in his civilian life as a lawyer, and how his other role as a vigilante operating above the law represents such a distinct conflict of interests. It opens up a vast field of opportunities for great storylines, and in this instance the writers have reached in and grabbed hold of something really meaty. If you’re looking for a lot of acrobatics and fistfights, this isn’t your book. Daredevil doesn’t even appear until the waning pages of this month’s story, so you’ll be waiting a while for that big throwdown at the end of it all. But if you’re down for a lengthy look at the professional life of Matt Murdock, if the dual nature of the character is a big part of what interests you about him, this story is the mother load. Long-time readers will notice a lot of similarities between this story and the one Brian Michael Bendis wrote a few years ago dealing with the trial of the White Tiger. They both offered a heavy dose of legal rhetoric, balanced by just enough extracurricular activity to keep your attention. It’s a tremendous story, an instant classic in the more mature, dramatic style that’s swept through several of Marvel’s higher profile books over the last few years, but it isn’t for everybody. Providing the visuals this month is the team of Michael Lark and Stefano Gaudiano, who bring their best Alex Maleev impression but leave a little something to be desired. Don’t get me wrong, their work is largely just fine, but they suffer from the comparison to their predecessor. The duo seems too committed to retaining the noir-ish qualities that Maleev successfully brought to the title, and not enough to adding their own dose of originality to the equation. They do a very nice job of retaining the mood, the atmosphere and the character of this series, but I just couldn’t shake that feeling that I’d seen it all before and at this point the repetition is beginning to wear thin. It’s become characteristic of Ed Brubaker’s books that you can’t really jump in mid-stream and appreciate the intricacies of his storytelling, and Daredevil #108 is no exception. As somebody who’s followed the series for his entire run, I’m noticing a lot of little seeds beginning to sprout that were planted at the outset of his run, and if I’d begun reading with this issue or with the beginning of this arc, most of that would be lost on me. This has the makings to be no less than the latest in a series of staggeringly good storylines, but it requires a lot of dedication to fully appreciate. Despite a disappointing showing from Lark and Gaudiano, I’ll be buying this issue and recommend you do the same. Just make sure you come prepared.